“Worship at The Cliff” is our Wednesday night gathering of all students in one room for worship. We meet upstairs (A.K.A. 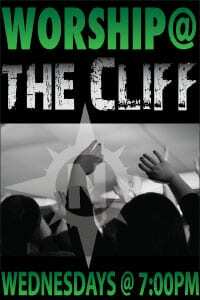 “The Cliff) at 7:00 pm, with worship led by Luke Davenport and our Student Praise Band and messages provided by Bro. Nick.